The mother of a 4-year-old boy and her boyfriend have been accused of beating the child to death for spilling his cereal. 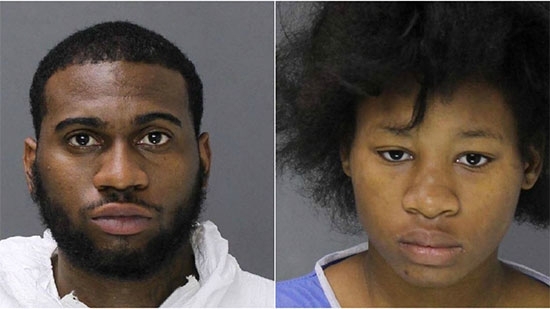 The Montgomery County District Attorney's Office announced that 19-year-old Lisa Smith and 26-year-old Keiff King have been arrested and charged with aggravated assault, criminal attempted murder, endangering the welfare of a child, and other related charges. Abington Township Police responded to the home on the 1800 block of Lukens Avenue in Willow Grove shortly after 6 p.m. on Monday. The boy, Tahjir Smith, was found unresponsive. He was taken to Abington Memorial Hospital where he was pronounced dead. The autopsy revealed fresh wounds and old rib fractures. The mother told authorities that the couple had repeatedly struck the boy with a sandal and hit him in the head after spilling his cereal. They were each remanded to the Montgomery County Correctional Facility in lieu of $500,000 bail each. There will be a preliminary hearing on January 31st. Two students were killed and 17 injured after a 15-year-old student opened fire in a rural Kentucky high school on Tuesday morning. The shooter was apprehended by police and taken into custody. He will be charged with murder and attempted murder. Police have not released the student's identity or possible motive. The shooting happened at Marshall County High School in Benton, KY, about 200 miles southwest of Louisville, KY. Benton is a small town of around 4,500 people. Students were gathered in a common area before school started when the shooting broke out. Many students ran from the school to nearby businesses or drove away. Two 15-year-olds were killed, a boy and a girl. Several of the wounded were flown to Nashville, TN which is 120 miles southeast of Benton. Philadelphia officials announced on Tuesday that they are looking into implementing safe injection sites for drug addicts as a way to combat overdose deaths. The city would become the first in the US to have such establishments. Last year, there were 1,200 overdose deaths in the city, the highest in the country. A safe injection site is a place where a drug user can go to use their drug under the supervision of a doctor and without fear of law enforcement. In case of overdose or medical emergency, the doctor and staff is present to implement life saving protocols and/or drug reversal medications. The sites also offer clean needles and can act as a pathway to treatment. Philadelphia Police Commissioner Richard Ross admitted he was completely against the idea, but has an open mind after talking with law enforcement colleagues in Vancouver, Canada, who do have the program. However, Pennsylvania Attorney General Josh Shapiro said "sanctioning a 'safe injection site' presents significant public safety concerns." Not to mention the legality issues. Philadelphia, itself, would not operate or fund the sites. They are hoping a private operator will establish them.